For those of you who like to follow the professional go scene, An Younggil 8P (r) recently finished writing a year-long series of articles for GoGameGuru profiling the top 20 professional go players of 2010. Throughout the series, Younggil goes well beyond the usual historical details to write about players’ personalities and go styles, as well as recounting his own meetings with many of them. Younggil’s intention was to introduce his professional colleagues to a Western audience as humans, rather than just pro go players. He also shares many insights into the life of a professional go player and the go scene in Korea. It makes fascinating reading for any serious go fan. The full list of bios includes: Lee Sedol, Kong Jie, Park Junghwan, Choi Cheolhan, Kang Dongyun, Heo Youngho, Gu Li, Xie He, Won Seongjin, Li Zhe, Zhou Ruiyang, Tuo Jiaxi, Lee Changho, Qiu Jun, Kim Jiseok, Wang Xi, Cho Hanseung, Chen Yaoye, Park Younghun and Lee Younggu. 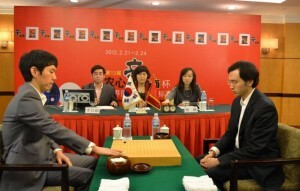 photo: Kong Jie (left) and Lee Sedol play in the final of the 23rd Fujitsu Cup (2010).